Few minutes distance from shopping malls, cultural attractions and business district. Contemporary European design style resort with classic chic décor rooms. Large variety of facilities and activities. Le Meridien Mina Seyahi is located on an artificial island Palm Jumeirah. The Anantara Dubai The Palm Resort & Spa is 23 km from the Burj Khalifa, a 15-minute drive from the water park Aqua Venture and 40 km from Dubai International Airport. The Anantara Dubai The Palm Resort & Spa is located on the iconic island of Palm Jumeirah in Dubai and has a unique sandy beach. It has 3 pools, seven restaurants and a Thai-inspired spa. Family holidays package in Le Meridien Mina Seyahi hotel with flight. 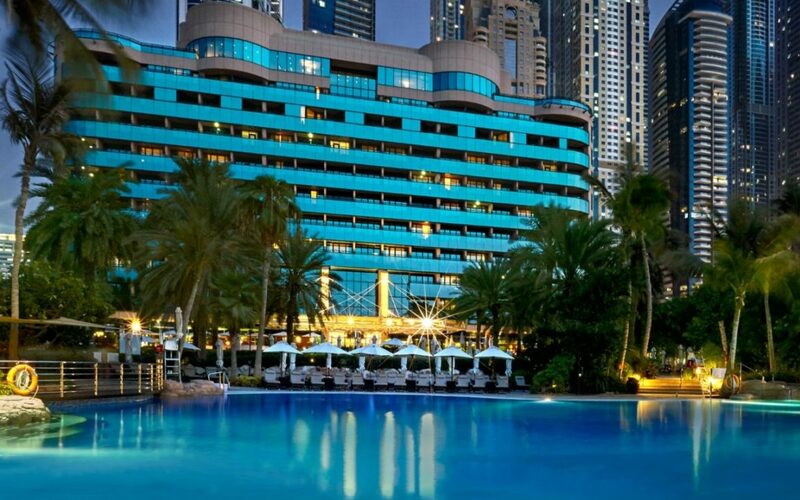 Located on the famed Jumeirah coastline, the hotel has a fully-equipped watersports centre and is located near to Dubai Marina, The Walk, the world-famous Emirates Golf Club and Montgomery Golf Course. The property features large grounds and 500 metres of exclusive beach providing privacy and space for all clients, and guests can also use the facilities of its sister hotel, The Westin Dubai Mina Seyahi located next door. The resort’s bright, stylish décor exudes an unpretentious and casual appeal that, combined with its fantastic facilities, makes Le Méridien Mina Seyahi a haven to suit all. Guests have a variety of dine around options, including al fresco dining at the popular Barasti Bar on the beach. The hotel offers the Family Club (open to young guests ages 4-12) with its host of games and activities, babysitting services, special menus, 2 shaded children’s pools, and daily beach games, ensuring there is always something to occupy children. For the adults, the watersports centre offers a comprehensive range of activities from skiing and windsurfing to wake boarding and surf ski kayaking. Deluxe sea view room– 34-36 m2. Luxurious room with high levels of comfort, service and gorgeous views of the Arabian Sea. Club sea view room– 34-36 m2. Luxurious rooms with panoramic views of the sea and benefits like a welcome drink, continental breakfast, separate check-in Lounge and airport transfer. Club superior room– 47-50 m2 of a luxurious suite, with a separate living room and complimentary access to the Club lounge. Airport transfers, Check-in lounge continental breakfast and other VIP amenities. Deluxe Suites– 107 m2.Luxurious suite, with a separate living room and complimentary access to the Club lounge. Airport transfers, Check-in lounge continental breakfast and other VIP amenities. Presidential Suite– 251 m2. Large suite with separate lounge and superb panoramic views of the Jumeirah beach. Buffet breakfast in Club Lounge, airport transfers, complimentary Internet Access, afternoon tea in Club lounge and complimentary hot and cold canapés. Latest recipe – French brasserie cuisine restaurant, with classic and hearty dishes from around the world. Horizon – A perfect bar to enjoy poolside casual snacks and delicious cocktails. Barasti – International cuisine in a relaxing restaurant with direct views of the sea, listening great music and delighting yourself with delicious cocktails. Latitude 25 – Sweet and savoury delicacies in a reinterpretation of a hotel lobby. Perfect for all coffee lovers and creative minds.